BCR-ABL1 is a fusion gene formed as a result of the t(9;22)(q34;q11) chromosomal translocation, the translocation that results in the formation of the Philadelphia chromosome. The Abelson murine leukaemia viral oncogene homolog 1 (ABL1) gene from 9q34 is translocated downstream to a region at 22q11 known as breakpoint cluster (BCR). The fusion gene encodes for a constitutionally active tyrosine kinase that has been shown to drive the expression chronic myeloid leukaemia phenotype. BCR-ABL1 gene has also been on implicated in the pathogens is of acute lymphoblastic leukaemia and in rare cases of acute myeloid leukaemia. The gene has been targeted with unparalleled success by the first tyrosine kinase inhibitor approved in clinical practice, imatinib. The ABL1 proto-oncogene is located on chromosome 9 at q34. Chromosome 22 has the BCR gene at 22q11. The ABL1 gene translocated downstream to the BCR gene as a result of the t(9;22)(q34;q11) translocation. ABL1-BCR translocation also occurs and may express but is of no clinical significance. The breakpoint of the ABL1 gene may be upstream exon 1a, between exon 1a and 1b or downstream exon 1b but it is almost always upstream exon 2. With rare exceptions all transcripts of BCR1-ABL1 gene have exon 2-11 of the ABL1 gene. The BCR breakpoints are variable and determine the size as well as the pathogenic properties of the BCR-ABL1 gene.. The breakpoint on the BCR gene are clustered in three regions known major cluster, minor cluster and micro cluster (Table 1). Depending on the location of breakpoint on the BCR gene three types of protein are synthesized. The p210 transcript is associated with CML and some patients with Philadelphia positive acute lymphoblastic leukaemia. The shorter p190 transcript is associated with philedelphia positive acute lymphoblastic leukaemia and some patients of chronic myeloid leukaemia. The CML that carry this mutation show monocytosis and have a more aggressive course. The p230 is the largest and the rarest of the BCR-ABL1 transcripts. It is associated with a more indolent course and is found in patients with the rare chronic neutrophilic leukaemia. Atypical transcripts e1a3, e13a3 and e6a2 have been described. ABL1 is a nuclear kinase whose activity is tightly regulated by the cell. BCR-ABL1 translocation results loss of regulation and the kinase is cosntitutively active. Sustitution of ABL1 at the N termnal by segments of the BCR gene result in the synthesis of a protein that has the capacity to dimerise. Dimerisation transphosphorylates and then aurtophsophorylates the the kinase fully activating it. The precise mechanism how BCR-ABL1 leads to chronic myeloid leukaemia is not known but activation of phosphatidylinositol kinase, RAS/Mitogen activated protein kinase and JAK/STAT pathway has been demonstrated in BCR-ABL1 positive cells. These pathways are involved in cellular growth and differentiation. The BCR-ABL1 kinase also phosphorylates proteins involved in adhesion and migration and this may have a role in premature release of myeloid cells in circulation. CML cells have a two to sixfold increase in reactive oxygen species and have impaired DNA repair. Reactive oxygen species can induce DNA double strand breaks. The results is additional mutations and these are believed to be responsible for blast crisis and acclerates phase. Tyrosine kinase inhibitors targeting the BCR-ABL1 protein induce a remission in most patients of CML. About half the patients who have achieved sustained complete molecular response relapse on discontinuation of the tyrosine kinase inhibitors. This suggests that the stemat least some CML stem cells are not BCR-ABL1 dependent for growth. Experimental observations support this hypothesis. The BCR-ABL1 gene was the first gene to be targeted by a tyrosine kinase inhibitor, imatinib. Imatinib was followed by dasatinib, nilotinib, Busotinib and Panotinob. Imatanib, Dasatinib and Nilotinib are approved to first line use. Imatinib has resulted in a 85% 8 year survival. Dasatinib and nolitinib are active in imatinib resistant CML and are now approved for first line use. Drug resistance results from mutations in BCR-ABL1 kinase. The T315I mutation or the gatekeeper mutations impaires access of TKIs to the BCR-ABL1 kinase making most drugs inactive. Panotinib can inhibit the T315I mutation. Barnes DJ Melo JV. 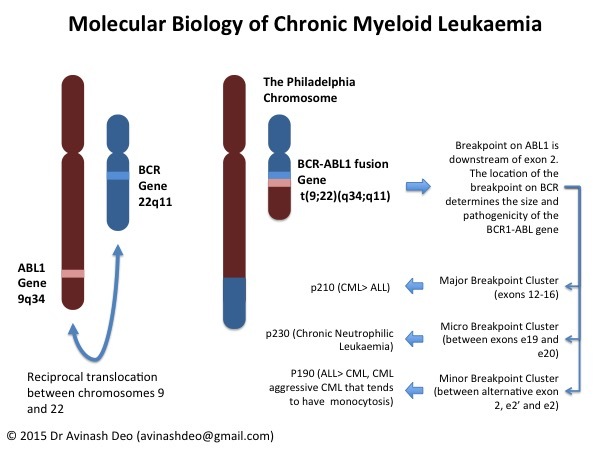 Molecular Basis of Chronic Myleoid Leukaemia. In Chronic Myeloproliferative Disorders: Cytogenetic and Molecular Anomalies. Bain Barbra J (Ed) 2003.